This is because outbound and inbound are a complementary team, pulling towards a common goal—your vital statistics: increased sales and customer retention. So, what’s outbound’s role in an increasingly digital domain? 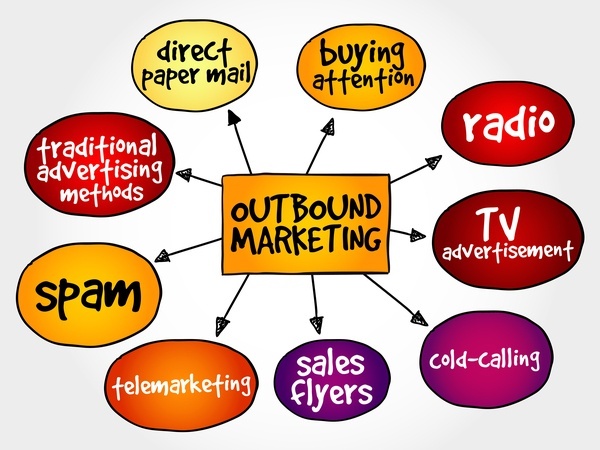 Whilst inbound focuses on generating interest in your content, outbound drives demand for your product or service. Unite the two and you more than double your efforts in converting leads to customers. Also known as mailshots (flyers, leaflets etc. ), direct mail markets your products and services via a range of promotional printed advertising materials, posted directly to your audience’s business or home address. Usually a bulk effort for cost effectiveness, direct mail is proven to drive strong results, with a 4.4% campaign response rate. It’s easy to understand, taking less cognitive effort to process. This gives it more impact and makes it more memorable. Even for millennials! This means: in a campaign to 1000 people, 43 more people will interact with your direct mail than emails. Not without cost, of course, so it pays to check out which sites best suit your audience and budget. Facebook comes in as the cheapest with Twitter in the higher ranks. Either way, they are all competitive avenues to push your advertising across a vast, ever-expanding demographic. Once you have posted your ad, you can boost it—pay just a little more to maximise its reach, i.e. push it in front of yet more people. To boost your ad, pick one that’s doing well—getting loads of likes, comments, shares. Bankroll it for added impetus and you’ll see its engagement catapult skywards, with payback in measurable ROI. Comparatively simple to set up and operate, PPC advertising involves creating an ad, adding an image, and linking to a landing page/website page. When someone searches on Google using appropriate keywords/phrases, a few of the topmost results feature the green Ad box below and to the left of the headline. These are PPC ads. You only pay when someone clicks on your ad. So, if your ad doesn’t work then you haven’t wasted money on a dud firework. When it comes to engaging people, you can’t beat getting on the blower. So much of today’s communication is virtual that a good, old-school phone call can humanise your business—putting a voice to your brand. As ever, it’s a numbers' game with a guaranteed death-count—but there’s always a percentage that hits base: people who are interested in what you have to offer and who go on to become leads. And today’s telephonology allows you can make more calls in less time than yesteryear. This, plus a sound CRM, can turn your sales team into a super-focused, sweet-talking lead machine. New product or service? Harness the power of email newsletters to broadcast your offering, quickly and easily. Automated marketing solutions allow you to create a branded, professional email newsletter that will impact on its receivers, impelling them to click through to your website. Voilà : more leads. Email marketing is still on the rise, despite social media’s relentless stomp. As long as you have the skills to create and send professional emails, to personalise them, to track and analyse the results, then they are swift to master and send. Effective missiles when sent to new leads, they are further strengthened by reliable sweeteners such as an offer. Who doesn’t love the promise of money off, so FREE! is a tempting, if not irresistible, bait when e-blasting. Up there with print and radio, trade shows have been on the scene quite a while—and remain vibrant opportunities to showcase your company. Think theatre: it is vital that your customer service skills are on point, that you know your onions, that you look the part, that you have high quality marketing materials to hand, including lead-sheets to log people’s details. Check if the organisers provide badge scanners as most provide badges that you can scan, with all the info flowing into a lead list available after the event. Digital marketing has not killed the paper-radio star. An effective pairing, they have much to offer, particularly for SMEs with a local presence. Local press media teams are open to negotiation, making these ads cost-efficient champions of your brand and offering. On the rise and one of the most engaging methods of marketing your content, video is also a No. I way to advertise your offering. You can upload your videos to YouTube and aim them at your audience. As with PPC, you only pay when someone shows an interest, so it’s a budget-friendly, highly effective outbound tactic. You need outbound marketing’s raw charm, nous and welly backing your sophisticated inbound activities. Contact bandv for a FREE consultation.